I was thrilled when I was asked to review The Sound of Music at the Winter Gardens on Tuesday evening as it is one of my favourite films. I did wonder if we were ever going to get there though as my normal 10 minute drive turned into an hour due to a serious accident nearby which caused absolute chaos on the local roads. I finally arrived home at 6.20 and got straight into Mark's car so we could set off to Blackpool. He had packed my tea into a plastic tub so I ate that on the way and after a short detour as traffic was queued for almost a mile back from the traffic lights at the A6 we arrived just in time! The Sound of Music must be one of the most famous and widely seen films in the world and is based on the true story of the Von Trapp family. Set in 1930’s Austria, Maria is struggling with life as a nun and is sent to the house of widower Captain Von Trapp as governess for his seven children. Maria falls in love first with the children and then their father and as world events unfold the family decide to flee Austria to the safety of Switzerland. his new production directed by Martin Connor and starring Lucy O’Byrne as Maria and Andrew Lancel as Captain von Trapp is touring the country and is showing in Blackpool until the 9th July. We are regular theatre goers and have seen lots of musicals over the last few years and it is very rare to watch a performance where every aspect of the show was so perfect. From the amazing set to the fantastic cast and the talented orchestra, the show was spot on from the start. Mark isn't really a fan of The Sound of Music and only came because he knew I liked it but he was really impressed with the show and the quality of all the cast. 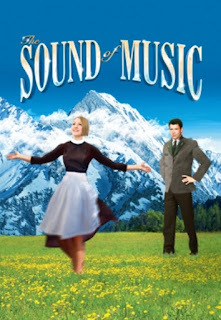 As The Sound of Music is such a famous musical we expected the singing to be good but we we were blown away with just how perfect it was, the singing was absolutely superb with every word of every song crystal clear and well sung. There are a lot of children in the show and often children are understandably not as good as the adult performers but this was not the case in this show. All the children performed perfectly and had lovely clear voices. The loudest applause of the evening went to Jan Hartley as Mother Abbess, singing Climb Ev’ry Mountain at the end of Act 1. It it was a truly moving performance as she has such a powerful voice that sounded simply amazing in the large theatre. Lucy O’Byrne, a runner up in TV’s The Voice, was perfectly cast as Maria, she has an amazing voice and was very similar in looks to Julie Andrews, who famously played Maria in the film version. Andrew Lancel, better known as Frank Foster from Coronation Street, played Captain Von Trapp. His performance of Edelweiss towards the end of the show was particularly moving and the audience loved it. The story took place in two locations, the Abbey and the von Trapp family home. The sets used for both were absolutely top quality and scene changes were fast and slick. The interior of the house was beautiful with a sweeping grand staircase and full height french windows with the beautiful mountains in the background. The costumes were excellent, there were a lot of costume changes with everything from nightdresses to traditional Austrian dirndl and sophisticated evening wear. I must make special mention of the orchestra too; live music really makes the most of a performance and the musicians playing last night were every bit as good as the actors on the stage. The sound was perfect and Tim Whiting did a fantastic job as musical director. This really is a show you must see, we had a fantastic night out and I can’t wait to see it again.